Half-Life is a first person shooter developed by Valve Corporation. At the time of its release on PCs it was seen as groundbreaking, and still ranks as one of the highest rated PC games of all time. The game was due to be ported to the Sega Dreamcast by Gearbox Software in a move that was much anticpated by Sega fans. However, a last minute decision saw the game be cancelled, despite playable (and finished) builds being showcased at trade shows and in magazine publications. 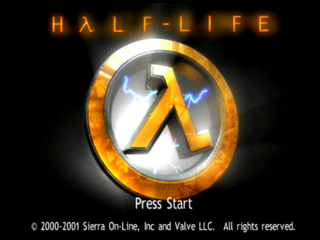 Half-Life was demonstrated at the European Computer Trade Show in 2000, being praised by the press and featuring as a cover story in many gaming magazines of the era and even in a television advertisement. Rather than being a straight port of the game, the Dreamcast version featured higher polygon models than its PC counterpart (allegedly twice as many polygons overall) and would have included an exclusive side-story titled Half-Life: Blue Shift. The Dreamcast version would not make an official playable public appearance until the first annual Gearbox Community Day 2011 which featured the last completed build as part of their legacy showcase. While the core game was set to be released in late 2000, a special online-enabled version was also planned for early 2001, which would have included Team Fortress Classic. All of the models in the game were updated to take advantage of the Dreamcast hardware. The nature of Half-Life's cancellation makes it perhaps the most notorious unreleased game for the Dreamcast. The initial plan was for the game to be released for the 2000 holiday season, with ancitipated for a release in North America and Europe during September 2000 (a date it missed - DC-UK later claimed it would arrive in Europe in November of that year, priced at the usual £39.99 in the UK). However, despite being publicised, the game saw an unexpected delay to mid-2001, by which point the Dreamcast console had been officially discontinued. Despite the game being finished, publisher Sierra On-Line, pulled the plug on the Dreamcast version a few weeks before release due to "changing market conditions". By this point it was the middle of June 2001 - Blue Shift had been released as a PC expansion pack (alongside the "High Definition Pack", upgrading all the in-game models), and much of the re-worked assets were being used in an upcoming PlayStation 2 version of the game, which launched in November 2001. Half-Life was not the only Dreamacst game to be delayed into 2001, only to then be cancelled, but it was the most high profile case, having received extensive magazine coverage through the latter half of 2000. Not only had the game been reviewed highly by publications on both sides of the Atlantic, retailers had been equipped with promotional material and display stands - everything except the game itself. Even the game's official strategy guide, published by Prima Games made it to market - there was no game to accompany it, but the publication still went on sale. Inevitably the full version of the Dreamcast game was leaked onto the internet, showing a near-complete product. Though the game is fully playable, the frame rate is inconsistent, and load times are often fairly lengthy. Saving is also an issue - the further the player gets through the current level, the more VMU blocks are demanded for saving. Once a level is completed, the number decreases again. In addition, each chapter is split with a password system to save progress alternatively with a three word system. 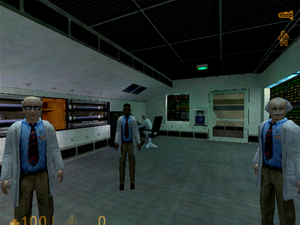 Some of the features found in the Dreamcast versions of Half-Life and Blue Shift were never brought forward into later copies of the game, although this mainly just includes some new NPC models, slightly altered level layouts and in-game Dreamcast references. In early 2012 a mod for the PC version was released on Steam to address this. Due to varying large VMU file sizes, a password system can be used instead to save progress. 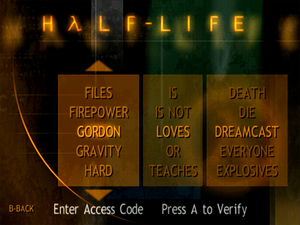 Half-Life is able to save progress anywhere in the game, however the further along in a chapter, the larger the file can get. Alternatively the game allows progress to be saved via a password system.